Boston Herald photographer Mark Garfinkel tells you how at his blog, Picture Boston. 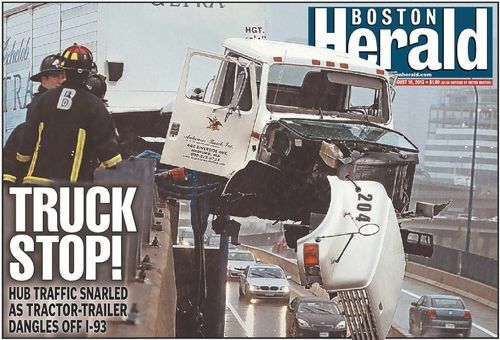 When the beer truck lurched over the guard rail on I-93 Friday, Garfinkel was camped out at the federal courthouse, waiting to see if the jury would reach a verdict in the James “Whitey” Bulger trial. He reports that he drove to the scene through heavy traffic, donned his safety vest and press credentials, and tried to keep his camera dry in the downpour. (Here is how the Herald covered it. The Boston Globe’s package is here.) Not as easy as it looks. Just ask the former photo staff of the Chicago Sun-Times. Image via Today’s Front Pages at the Newseum. Did you really write “The Boston Globe’s PACKAGE is here”? And thus the pornification of our discourse continues. I’m glad it wasn’t the rig transporting the Budweiser Clydesdales.